I am excited to introduce a guest blogger for the week, Margaret. She has been working with identified adults in need of assistance on a day to day basis for the past few years and is here today to talk a little bit of how different ways of communication is essential. Take it away Margaret! Communication is essential to our lives and how we interact amongst each other. Now please do not mistake “Communication” for “Speaking” as they are not mutually exclusive. One can communicate with a look, a gesture, a word, or a machine. It would not be correct or wise to conclude that just because someone cannot speak means they cannot express themselves. Certainly there are those who may not express themselves fully or are in need some help from others in the process, but anyone can learn independently to share what they have to say with the world. Take for example a young woman, whom I shall refer to as Amy, I have come to know quite well over the past couple of years. She had learned over the years that her inability to verbally speak was a great way to have others communicate for her. It was not that she was not expressive, but rather the opposite. Though unable to formulate words other than “huh,” “yeah,” and “mum,” she is adept to vocalizing, using her volume and tone to share pleasure or displeasure at any given moment, which many can find off-putting or confusing. But, it is by her vocalizations that she is able to make phone calls with the people in her life, done so by having whoever is with her during the call relay every detail of the day to the receiver, to which that person on the other line would repeat these facts back to Amy for her to respond (often with great enthusiasm) to the various activities she participated in. In public settings, Amy would often look to others to make statements or answer questions that were not a simple “Yes” or “No” question. 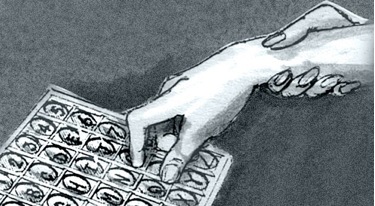 While having a limited vocabulary in a modified Sign Language helped her communicate some basic needs, such as “Help,” “Bathroom,” “Food,” and “Drink,” there was much to her that we knew she could be telling us. 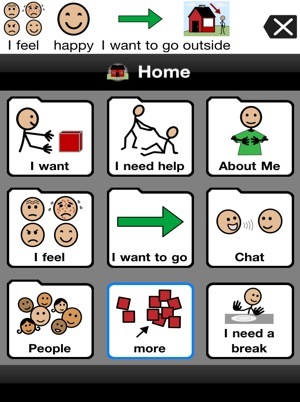 Now, here I will share briefly one practice being used for people in similar situations who cannot speak or speak clearly, which is facilitated communication, or the assisting of an individual who is typing or spelling out words on a computer, iPad, or Alphabet Chart that he or she wishes to say. A controversy with this method is the misunderstanding that the person facilitating this is guiding or forcing the particular letters to be typed while holding onto the arm of the one typing, so what is being said are not the true words we are meant to hear. Having been trained in directing and utilizing facilitated communication, I can assure you that the image above is not accurate as to how one approaches. The person who is typing ideally knows how to type and what they want to type, and will actively reach for the correct letters necessary for a word they need or want to convey. Oftentimes, this individual may have difficulties processing and need to “reset” before they reach out to hit another letter. This is where the facilitator uses their hand as a support (using the palm of our hand and not gripping as the photo indicates) to hold back the arm in order for the one typing to stop and think about what letter it is they need to press next, so that they may proceed and reach out to select the correct letter. When this “reaching out” occurs, the person supporting does not actively hold back or push forward the hand to try and control what is being typed. 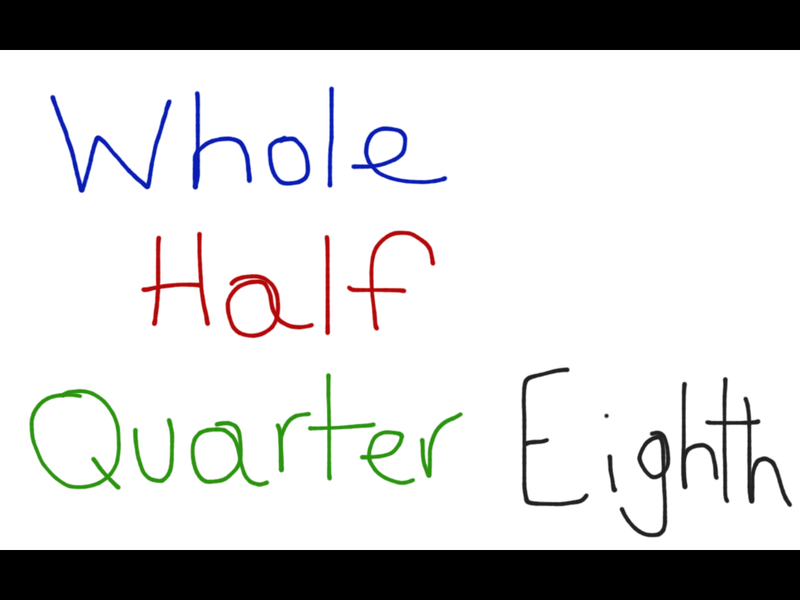 Now that I have gotten that out of the way, due to Amy’s fine motor skills, or lack thereof, typing out letters to spell proves to be a difficult task, as well as being able to differentiate some of them by their appearance. Because of this, the above form of facilitated communication would actually further limit her ability to communicate. Instead, we have had the pleasure of using a wonderful program for the iPad called Proloquo2Go (unfortunately not a free application when used for its full potential), and we have given her a voice that she can control. Using images to represent a word or phrase, we have given a source of ways to express needs and wants to anyone, and not just those of us who knew her enough to recognize her vague vocalizations and modified signs. The success of this program has been made very clear when, after a wonderful and very new trip down to Florida, we gave her a series of phrases that simply described what she did during this vacation. Then while on the phone with someone, she was able to say “I went to the ocean for the first time,” or “I rode on the Big Thunder Mountain Railroad” or “I stayed at many hotels” without needing others to speak for her. Through this device, she has found her voice, and found how receptive people can be when they are able to respond directly to her. There is no greater joy than seeing someone so lost in her “learned helplessness” (ie letting others speak for her) discover just how communicative she can be. Thank you for sharing your expertise Margaret! Have you ever walked into a school lately and really taken a good look at the expression on a teachers face? Normally one would say it is a look of utter exhaustion! With the piles of paperwork, IEPs and 504s to follow, state tests, evaluations, grades, behavior issues, professional development, and whatever else is going on that day one would be shocked if we had time to teach a lesson! The time that is spent running a classroom takes up a lot of focus and time that could be spent truly educating and engaging what we hope are soon to be lifelong learners sitting in the seats in front of us. I have been told that what makes good classroom management is not only the ability to command respect and lead with a fair mind, but also to be able to completely engage the students with every important concept I teach. 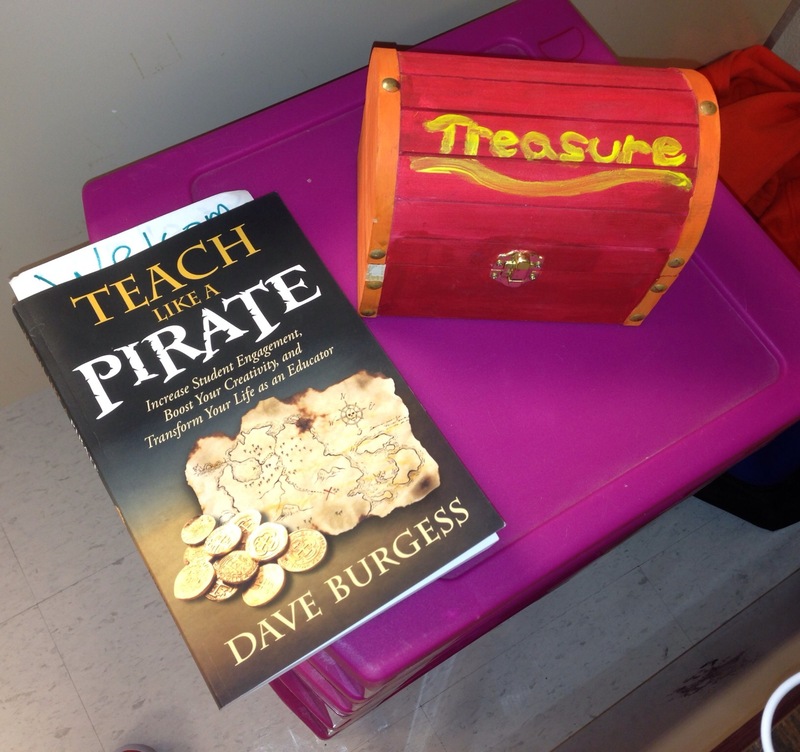 I recently read a book entitled Teach Like a Pirate by Dave Burgess (Yes, I thought it was literally going to be about Pirates but it was still very interesting!) This book got down to what truly can engage a student in this 21st century learning atmosphere reminding the reader what it takes to keep them interested from the time they walk in to the room until the time they walk out. Passion- It truly is all about the passion. You wouldn’t be teaching if you didn’t have passion for educating the next generation. In order to truly engage your students they need to know that your passionate about it too. Emanate confidence about the subject and how much you love it and it will radiate around the room. Raport- The most simple thing to engage is a student is to build a connection. Many times I have had a student stop by my room just to tell me how their day was, in my class a way I build that connection is to use music they listen to on the radio in class. Some teachers will give me a funny look when I say this, but I make it work even if I have to spend some time changing lyrics and editing audio to make it work. Just like an actual couple relationship, each side has to put in effort to make it work. Asking the Right Questions- You can never ask too many questions! Asking the right ones that will provoke a deeper thinking and the want for self discovery will engage your students. Sometimes I like to think that their brain is asleep when they walk in school in the morning, it just takes the right questions to wake it up and begin the learning. Ask a question as soon as they enter the room and keep the gears running all day long. Hooks- Having the proper hook to get your students interested makes all the difference. This book is the ultimate guide to catching their attention from minute one of class. From the movement hooks to the acting to the technology and even the questioning, you will find the right ones for you in here. Pirate Crew- Arrr need help? Need support? A little too shy to do this on ye own? Form a crew of goofy scalawags to join you in your journey to be the wackiest and most engaging teacher in the building! I’ve gone through it and so can you! This book was the silliest and best teacher read I have gone through in a long time. With the tricks in Teach Like a Pirate and the book Teach Like a Champion my classroom is quickly turning into a popular space! What kind of hooks do you use to engage your students? Have you ever read this book before? Lately I have had movie music on the brain, playing the Theme from Jaws at random times, listening to movie soundtracks, and occasionally bursting out into song from my favorite motion pictures. We tend to hear these epic soundtracks to our Hollywood made stories everywhere and everyone young and small knows what they are and where they come from. My thought is how would we teach this to our younger students? This teaching process has already been mastered by the music tech greats at the higher level, how would we simplify those activities so elementary students could enjoy learning the sounds from movies they hear so often. Now what sort of activities could you bring to the classroom to teach them? Playing Movie Music – With Joytune’s new movie music pack myself and my students can enjoy the music of John Williams all the time. It might sound too hard for younger students but when you simplify it down to just the main theme, younger students can enjoy playing movie music on classroom instruments. Storybook Soundtracks- Movies are just live stories, take a storybook and turn it into a movie. Have your students read it, draw the pictures, do the foley art and create the background track. iMovie Trailers- Each genre of movie has it’s own distinct sound. Have your students easily create iMovie trailers using the iMovie app on the iPads to go along with the music. Once they are done, have a movie class and bring the popcorn! Foley Artists– The art of foley, teaching the students the true art of sound performance before all these big fancy sound machines came. It is a great lesson for sounds of found objects. Make your own music- Cut out the sound and have the kids put the voices and music in themselves using garageband or audacity. What sort of ways would you teach younger students how music from movies works? I truly have tried to turn a hugely devastating memory into positive energy this past week. I’m just one of those people that won’t take failure at an option and the easy roads in my life always seem to be closed so like most, I always am faced with driving through the challenging paths. When I need to just feel right again I usually turn to drumming, so that is what I focused on this week for lessons with my students to let them leave my classroom with smiles, and a lasting memory of leaving my classroom feeling good and loving music. We started with a few games and activities from drum circle guru Kalani . “Where’s Froggy?” – A cute hot and cold game that my students were absolutely gaga for. 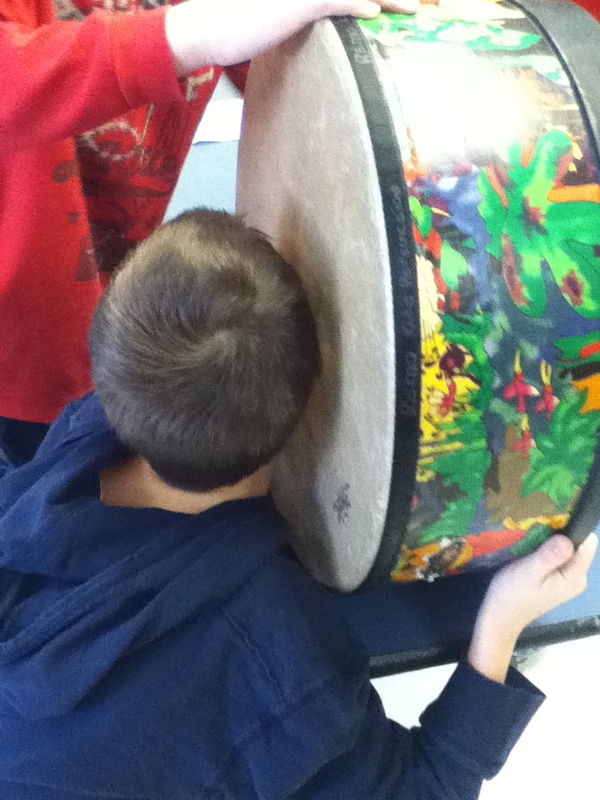 Drum Call- Gets the students warmed up to play and listening to the numbers you call out. Is also a great way to throw leadership to a student who normally will not speak up. Rumble Ball- I get to play with a playground ball and have my students experimenting with sound, I dare you to find a single thing wrong with this. These games had the students in stitches from laughter, especially when my frog from Where’s Froggy was hidden in some hilarious spots! After the games we decided to spend the last 15 minutes or so drumming, just drumming that simple. I went over a simple rock beat with them and chose two songs from my KidzBop playlist for students to use that rock beat to play and sing. It truly was a surreal moment being able to sit, listen and watch this go on as I played right along with them. Most classes got into it, singing, grooving in their seats, and drumming on the carpet so hard their hands hurt after it was all over but begged for more. Its that feeling right there that you want walking away from a class like this, being able to just get lost in the music around you and letting out all of that anger or bent up energy screaming to get out, eventually taking with you the emotions of peace and comfort.